Copy the Monster_Website folder from the studentShared(Q): drive to your area. Go to the File menu and choose Open Folder. 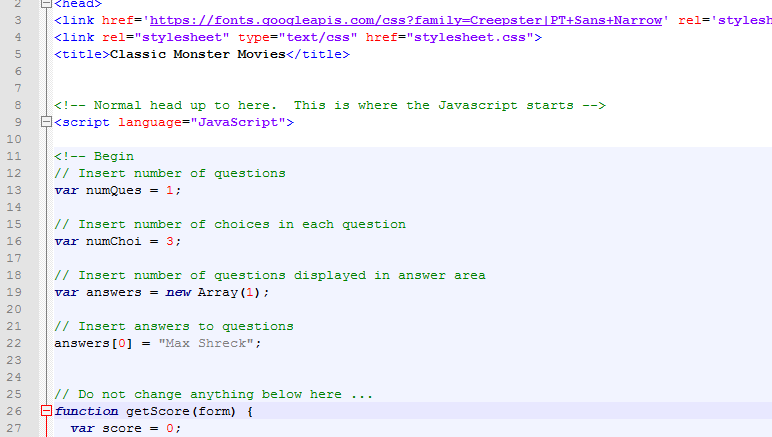 Browse to the Monster_Website folder and click Select Folder. 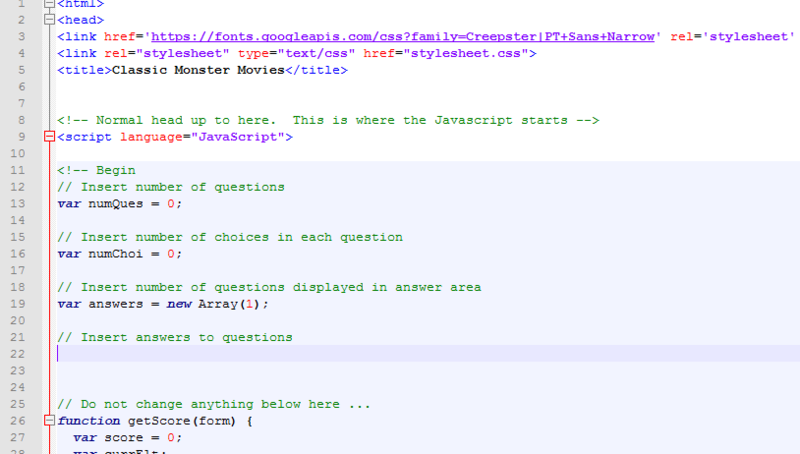 On the left hand side you will see several HTML files and a CSS file. Have a quick look through and see what you recognise from previous lessons. Your teacher will ask you some questions about this mini website. 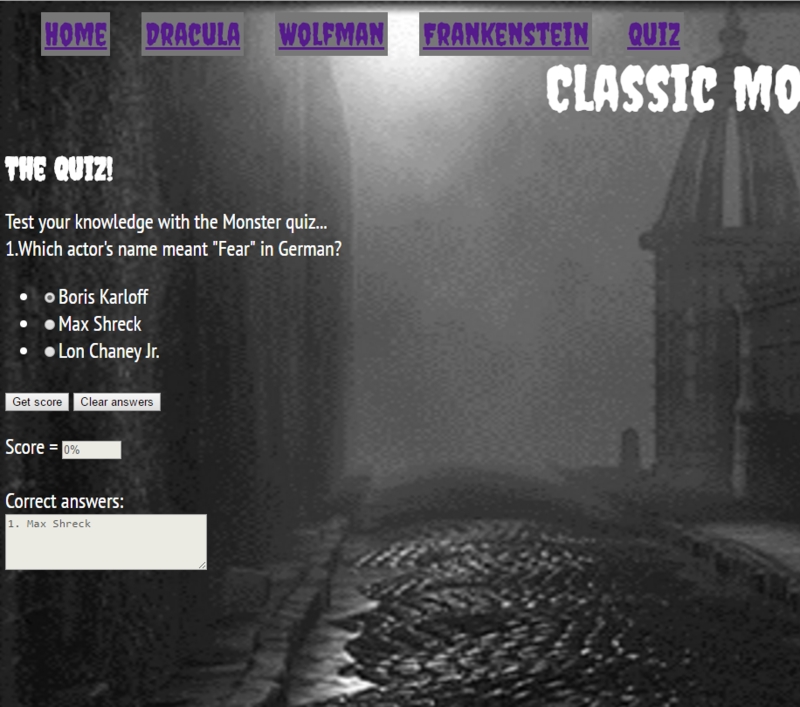 We’re going to make a page which asks questions about the movie monsters on the site. There is also a little odd code towards the bottom of the page but don’t worry about that. For now we won’t worry too much about the main code (although you’ll see they’re just Python-like loops), and we’ll give values to some variables, saying how many questions there are, how many choices there are for each question, and what the correct answer is. Make sure this is IDENTICAL to your html above (no extra spaces or characters). What if we actually wanted four choices instead of three for each question? Only 3 Monsters? No good at all. Add the original “Mummy”. We’ll need a new page adding, the menus (of each page) altering, and a couple of images adding. 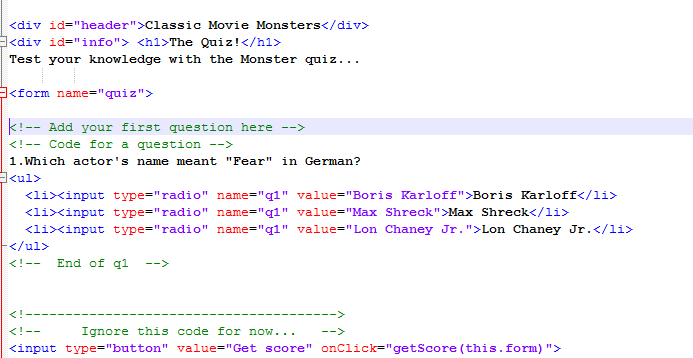 Of course, you’ll also want to add another quiz question. Can you change the background? Could you adapt this code (think – everything inside the <script> tags in the head, and the <form> tags in the body, and add them to your own site?